The Garmin Forerunner 935 is a GPS sports watch for serious athletes. We're talking triathletes and ultra marathon runners here, not 20 minutes on the treadmill kind of folk. A natural successor to the Forerunner 735XT and a potential watch upgrade for Forerunner 920XT owners, the 935 essentially crams a lot of the features included on the Fenix 5 into a slimmer design. You get the same sports tracking modes, built-in heart rate monitor and a raft of metrics that aim to optimise training and aid recovery. It also offers Connect IQ support plus smartwatch features like notification support, and packs in plenty of battery life so it goes the distance when you need to go the distance. At $499.99 or $649.99 for the Tri-bundle, it doesn't come cheap and is priced at around the same as the Fenix 5. It's also more expensive than the Suunto Spartan Sport Wrist HR and the Polar V800. We've been living with the Forerunner 935 for a few weeks, putting it through its paces to see if it's one to keep on the wrist or throw in the drawer. Here's our comprehensive verdict. Whilst it might share many features with the Fenix 5, it certainly doesn't look anything like the daddy of the Garmin watch family. That might disappoint fans of the Fenix 5's steely good looks, but what it lacks in style it certainly makes up for in other areas. It's every bit a Forerunner watch in looks and stature with its plastic body and interchangeable strap combo. Yes, it's undeniably sporty, but its far from hulking frame is what makes it really appealing. Especially if you don't like training with big, bulky watches. Weighing in at just 49g and measuring just 13.9m thick, it's only slightly chunkier than the Forerunner 235, which makes it all that more impressive that Garmin has managed to pack so much tech into a small body. The biggest compliment I can give it is that I just didn't want to take it off. It's really comfortable to wear as a normal watch and it's not a nuisance to take to bed when you want to monitor sleep. And as is standard with Garmin's watches it's safe to swim with, letting you take a dip at up to 50 metres depth. There's no touchscreen here, so you're relying on five physical buttons positioned around the watch face with their functions all clearly marked out on the slim bezel. It's a 1.2-inch transflective display with the same 240 x 240 resolution you'll find on the Fenix 5, with a backlight to aid your night-time training. As far as sports watch displays go, it's a solid performer and a decent size to review data. Around the back of the watch is where you'll find the pins for the proprietary charging cable to plug into, and of course the optical heart rate sensor. What's instantly noticeable is the sensor bump is not as prominent as on other Garmin watches with built-in HR support. As already mentioned, a lot of the hardware and features from the Fenix 5 also make it onto the Forerunner 935. In terms of sensors, there's GPS and GLONASS, a compass, gyroscope, accelerometer and a thermometer. There's also a barometric altimeter to track elevation guide, which doesn't appear on the 735XT. GPS performance is as we've come to expect from a Garmin sports watch. It can take seconds to pick up a signal or no more than minute, based on our time with it. We put it up against the TomTom Spark 3, which is also quick to lock onto a signal, and the Forerunner 935 was the speedier of the two on more than a few occasions. When it comes to the data, aspects like pace and elevation were near identical as well. Dedicated sports tracking modes include running, treadmill running, indoor track running, cycling indoors and outdoors, pool and open water swimming plus a triathlon mode that can also track transitions. But there's more. You can record hikes, trail runs, skiing, paddle sports and golf as well. We've focused on the run tracking support here, but you can see how the Forerunner 935 fared in our best GPS cycling watches big test and check out swim tracking in our Fenix 5 review for an idea of what you can expect. The performance and features in the pool are identical. For running, you'll get all the standard metrics like pace, speed, cadence and elevation. You can unlock more running dynamics but you'll need to invest in Garmin's Running Dynamics Pod to get those. The $69 wearable clips onto the waistband of your running gear and measures torso movement to dish out data on vertical oscillation, ground contact time, stride length and lactate threshold. This essentially replaces the extra data that's delivered via the Garmin chest strap, now that the heart rate stuff is done from the wrist. The big play for Garmin here is taking the sensor and tracking data to feed into new training specific features. Training Status factors in fitness levels and logged sessions to make sure you don't over train. So it'll tell you for instance if your fitness is improving, being maintained or even peaking. I found this feature really useful. With my marathon training intensifying that status was being maintained. But when I missed a couple of training runs and slept badly for a couple of nights the unproductive status popped up, backing up the fact that perhaps I should make sure I get a good night's rest before my next session. Training Effect uses heart rate variability to score your session as to whether it was productive or highly demanding. That feeds into the Training Load, which needs a week's worth of data to indicate whether you've got the intensity of your training program right. There's also VO2 Max support, with that data also used alongside training session data to predict finishing times for 5K, 10k, half marathon and full marathon races. We've tested VO2 Max across a host of wearable devices, and found Garmin's (or rather its partner FirstBeat's) estimations to be the best. It takes a few sessions for those predictions to really be on the money and if you're running long distance races, you'll need that long run training data for the predictor feature to be of any real benefit. 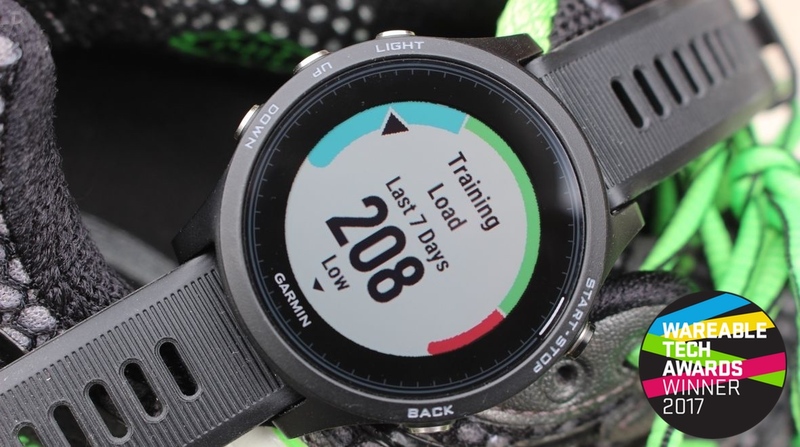 All of these features could be overwhelming even for data-loving athletes, but crucially Garmin presents it all in a way that makes it easy to absorb the information and understand what might be affecting positive or negative performances. It's these kind of insights that runners will want, or maybe didn't know they wanted, that can really help better optimise your training routine. Garmin, like Suunto and Polar, has taken its time to introduce optical heart rate sensors and that's a lot to do with the fact that it's really difficult to get good readings from the wrist. That's why ANT+ chest straps can be paired with the Forerunner 935 if you want what is considered the gold standard for data accuracy. Garmin is still using its own Elevate heart rate technology but has moved onto version 2.0, which doesn't change the hardware but does improve the software algorithms interpreting the readings, making sure the data is as accurate and as useful as it can be from one of the weakest parts of the body to capture that information. Putting the Forerunner 935 up against the Polar H10 chest strap, it actually fared really well and is definitely an improvement on what we've seen from Garmin's heart rate setup in the past. Below is an outdoor run in hot conditions with some high intensity sections thrown in. As you can see, the average heart rate and max heart rate readings are within 1-2 bpm of each other. The graphs though show that the optical heart rate sensor in the Forerunner 935 can take a little extra time to drop back down when we stopped to walk or pick up again during the running session. When we moved to the treadmill, the graphs once again were pretty similar with the dips in heart rate consistent and the average heart rate and maximum heart rate readings just 1 bpm out from each other. What is clear here is that improvements have been made. When the running terrain is pretty consistent the data is pretty in line with a chest strap. High intensity training though does still seem to be sticking point, and we'd still opt for a strap for the on the money data. But this is definitely a step in the right direction for Garmin. Plugging Fitbit-esque features into a sports watch has in most cases felt like an afterthought in most cases. But that's changing now, and companies including Garmin are seeing the value in offering 24/7 tracking. The Forerunner 935 covers a lot as well including step counting, tracking distance and floors climbed, intensity minutes and sleep monitoring. It will also measure resting heart rate data throughout the day and night. While there's plenty of data recorded, Garmin does its best to keep you motivated to stay active and moving. So daily step goals are adjusted based on the previous day's efforts and the Move bar will still flash up when you've been inactive for too long. These are the features that have made Garmin's fitness trackers some of the best to use and it's well integrated into the Forerunner 935 experience. This is a solid fitness tracker built into a sports watch. One of the most notable changes is Insights, Garmin's software that analyses the data to recognise trends and offer tips and recommendations. It's taken some time for this feature to prove useful, but now the digital coaching is really starting to offer something of value, whether it's to do with sleep or keeping up your step count. We've praised Garmin in the past for its approach to adding smartwatch features to sports watches, and that doesn't really change with the Forerunner 935. You can control the flow of notifications from the Garmin Connect app and once you're done, things run smoothly. Native and third party notifications appear as quickly as they do on your phone and they're easy to consume and clear. There's also a dedicated display on the watch that acts like a notification tray if you've missed something. Most notifications can only be cleared but there are some that are more actionable, like dialling a number from a missed call. It's still one of our favourite examples of how notification support should be done. Away from notifications, there are other smartwatch features here to keep you away from your phone. Pressing down on the top left button on the watch brings up music controls, a find my phone feature and the ability to save location. There's also a nice calendar screen as well if you want to glance at your day's appointments. If you compare Garmin's smartwatch features to the likes of Polar, Suunto and its non existence on TomTom's watches, there's only one winner for me at the moment. If you've had your hands on a Garmin fitness tracker or sports watch recently then these app surroundings will feel very familiar. Garmin Connect still comes in smartphone and web app form and aside from a more user-friendly setup process the experience hasn't changed all that much. For newcomers to the platform it still feels a bit of an overwhelming place. There are multiple data screens plus a whole host of additional settings and modes to tinker with. Activity tracking is confined to one screen, breaking down steps and sleep time. The MyFitnessPal support means you can integrate food tracking here as well. Keep swiping and you'll see screens dedicated to run tracking, swimming, cycling and more. It's when you need to drill down into these activities or workout sessions where Connect really shines, giving you more data than most will know what to do with. It still feels as though Garmin, much like Polar and Suunto, still suffers from being stuck in a web app world. As a result, the Connect companion smartphone app still needs to improve on the way it leads people through the screens. Even a simple search bar function would make it easier to wade through the settings, many of which will remain undiscovered and never used. As the Forerunner 935 is one of Garmin's high-end sports watches it does also support Connect IQ, the company's app store, which is not quite an app storefront in the same way that Google Play or the Apple App Store is. It is improving slowly but surely though, with better Connect IQ apps now cropping up, and Garmin is getting more involved by adding features like smart home support. The Forerunner 935 serves up a really strong battery life performance. According to Garmin, it should manage 24 hours in GPS mode or 60 hours in UltraTrac battery saver mode. If you're just using it as a watch, then it can go up to two weeks without charging. Even with notifications support switched on, daily activity tracking and regular running sessions (5-6 a week), it managed to get through 10 days. When it did finally die, during a three-hour run, it saved the part of the session it had tracked before shutting itself off. When that low battery message flashed up early in the run I feared it wouldn't make it through 20 minutes of tracking, but we have to applaud the work Garmin has done to keep its watches going even when you're running low. It takes a couple of hours to power up from flat, so it's not exactly the quickest charger, but that's a pretty standard charging time for Garmin watches. Garmin is on a roll and the Forerunner 935 is yet another beast of a multisport GPS watch off the conveyor belt. It's a tracking powerhouse and the new metrics based around optimising your training and recovery are really great additions. Optical HR performance, while better, is still a little sketchy in places so don't ditch that chest strap just yet. If you want all of the best qualities of the Fenix 5 inside a slimmer and smaller body then this is the one for you.